Acne can be a hard to treat condition and you may have tried everything known to man to try and clear it up. It causes hard pustules on the skin, especially the face. It is caused by clogged oil ducts and may also have symptoms like redness, crater like scarring, and open lesions. You might be considering trying different home remedies, and apple cider vinegar may be an option for you. Apple cider vinegar, known as ACV, has many different health properties that can benefit your body in many ways. Read further to see how ACV can work for acne, and how to use it for the best results. How Does Apple Cider Vinegar Work for Acne? The skin has a naturally acidic environment to ward off bacteria and fungus. The use of daily washes, genetics, and acne medication can all change the skin environment and make it more susceptible to acne. Apple cider vinegar for acne can help improve the acidic environment of the skin, so it can protect itself from germs. It even has astringent properties that can open up clogged pores. The acidity works to help get rid of bacteria, dirt, any leftover makeup, dead skin, and oil. When you use ACV, you get the benefits of a tonic, a pH balancer, and nutrients your skin needs. Apple cider vinegar is rich in potassium, acetic acid, magnesium, enzymes, and probiotics that work together to nourish your skin. The nutrients in ACV work together to restore a healthy balance. The probiotics feed healthy bacteria to the skin surface, while the acetic acid gets rid of the unhealthy bacteria that can lead to acne breakouts. When you use ACV as a toner on your face, it works as an "all-natural" antibiotic getting rid of unhealthy bacteria on contact. Apple cider vinegar can also help give your immune system a boost to fight off acne from the inside of your body to the outside. If you are using raw organic ACV, there is a good amount of beta-carotene that will help nourish healthy skin regeneration. Detoxes any toxins and free-radicals that cause acne. It may seem drying, but is actually a natural skin protectant helping your skin breathe. It is a natural exfoliant containing alpha-hydroxy acids. Balances the pH of the skin which keeps oil production in check. Has natural anti-inflammatory properties to reduce inflammation and redness. ACV is pretty easy to mix-up and keeps well, for just pennies per use. It is all-natural and a healthy way to combat acne. There are a few different ways to use it, try them all and decide which one works best for you. Mix ACV 1:1 with water. Dip a cotton ball into solution and dab directly on pimples. Note: If your skin is very sensitive, try adding water in a 2:1 ratio. Set water on heatproof area. Pour in ¼ cup ACV. Place towel over head and then face over steam. Keep your face in the steam for 5 to 10 minutes. Dilute ACV 2 parts water and 1 part ACV. Put in a clean spray bottle. Spritz acne areas once daily. Leave for 15 minutes until dry. Mix together 2 tbsp. apple cider vinegar and ¼ tsp. baking soda. Stir in ½ cup spring water and allow to fizz. Stir into one 8 oz. cup of tea with honey. You can also use this as a scrub for acne prone areas. Take an 8 oz. glass of water and stir in 2 tbsp. ACV. Sip slowly through a straw to protect teeth. Follow with one-full glass of water. For better taste, add 1 tsp. honey. Mix 32 oz. spring water with 2 tbsp. apple cider vinegar. Stir in 2 tbsp. honey, maple syrup or molasses (your choice). Mix well and take 1 tbsp. 3 times daily before meals. Drink plenty of fluids with your meal. Store in sealed container in fridge for up to 1 week. Clean your face with gentle soap and warm water. Spritz your face with ACV Spritz (recipe above). Take 2 tbsp. raw organic honey and smooth over your face. Massage honey into skin for 2 minutes until honey starts to dry. Allow honey to dry on face for 15 minutes. This is best when done up to 3 times weekly. 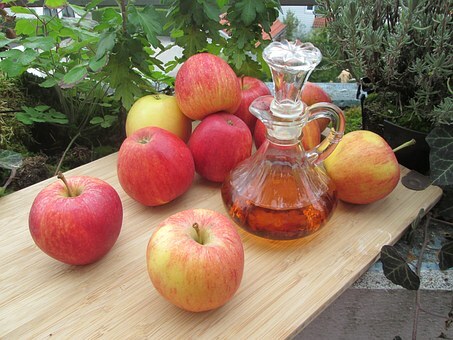 Always dilute apple cider vinegar with plain water before using. Always dilute at least 50/50 water to ACV. Always use a straw when taking ACV orally. It can take the enamel off your teeth. Apple cider vinegar can alter the pH of the body. Drink once daily or once every other day depending on how the body responds.